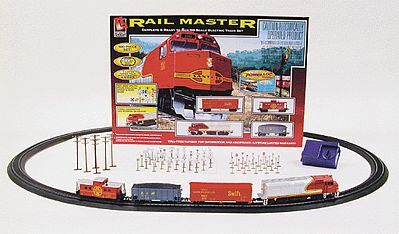 SaveOn-Model-Trains.com is brought to you by Hobbylinc.com. Family owned and operated since 1971, Hobbylinc is dedicated to providing the largest selection of hobby supplies at the lowest possible price with a dedication to providing excellent customer service. Easy to set up, operate and move; great for beginners. 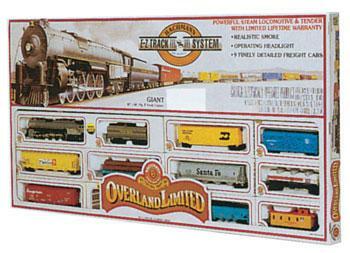 Entire train set comes with a lifetime limited warranty. There are over 100 pieces included in this set. Contains utility poles, street and road signs. U.L. listed power pack with forward and reverse. 12 pieces of Power-Loc track to create a 45'' x 36'' oval. Metal and plastic construction. Brightly painted details on loco and cars. UL listed power pack. E-Z Track snap-fit track (with steel rail) and roadbed system. Create a 65'' X 38'' oval track: twelve 18'' radius curved, one 9'' straight terminal rerailer, five 9'' straight. Union Pacific Overland 4-8-4 steam locomotive and tender with operating smoke and headlight (smoke fluid included). 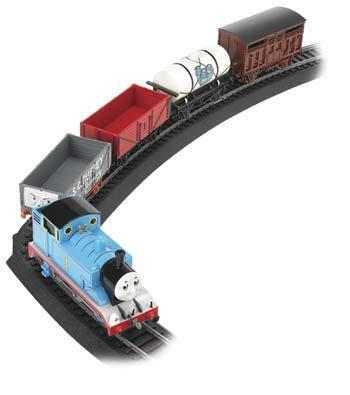 Authentically reproduced Thomas and Friends. Unique New Side-Locking Track System. Solid Roadbed Base offers Durability and Support on Any Surface. Power-Loc System clicks Together Instantly and Locks Track Securely. Working Switch Tracks for Added Realism and Fun. Operating Coal and Gravel Unloaders Dump Real Cargo. All Freight Cars and Locomotives are Exact Duplicates of The Full-Sized Counterparts. A 24'' circle of the Bachmann E-Z Track. 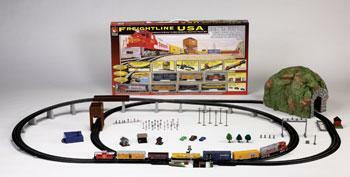 This train set includes the E-Z Track snap-fit track and roadbed system and is ready-to-run. Nickel silver track with gray roadbed. Northern 4-8-4 steam locomotive and tender w/operating headlight. Locomotive is all black w/white writing ''A.T. & S.F.''. Tender is all black w/white Santa Fe #3780. 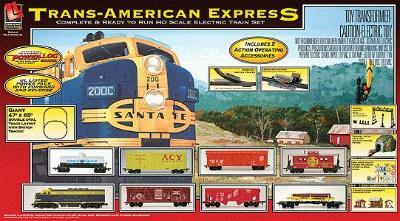 Set includes eight finely detailed cars. Easy-to-assmeble steel allow track that can be used on floors or carpet. With the track provided, you can build either a. 4'3'' circle or 8'2'' x 4'3'' oval layout. The East Tennessee & Western North Carolina 4-6-0 steam locomotive is exquisitely detailed & features the following. -Operating headlight & smoke stack. © Hobbylinc.com. All rights reserved. Images and Descriptions are representative only, actual items may vary. Prices subject to change without notice. Hobbylinc maintains no responsibility for inadvertent errors. hobbylinc.com is a full line hobby shop which carries model trains, train sets, and much more.